To take elements of two or more pre-existing pieces of music and combine them to make a new song. A song comprised of elements of two or more pre-existing pieces of music. 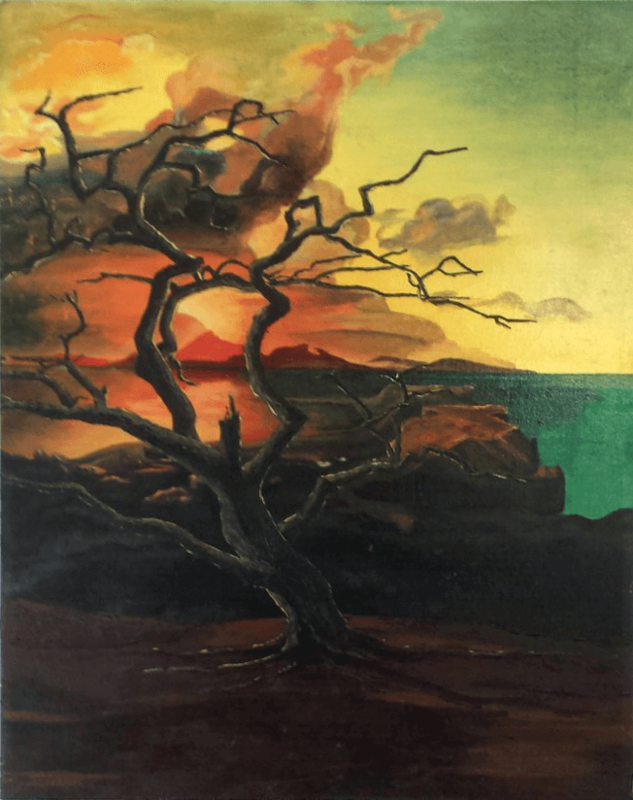 Unidentified reference painting of a coastal sunset. 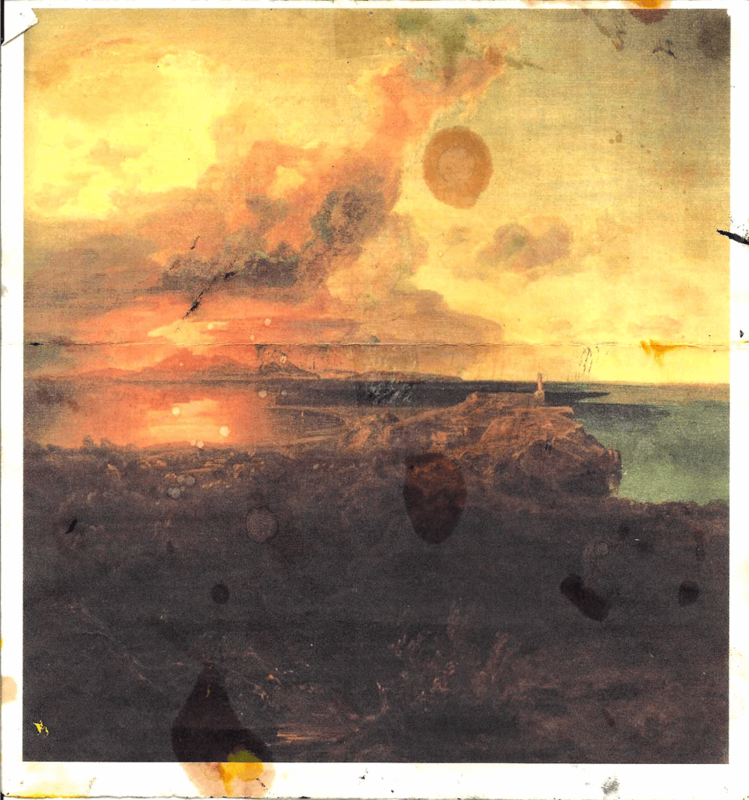 Anyway, I finally settled on Caspar David Friedrich’s Tree of Crows and this seascape I can no longer identify. Tree of Crows, which was acquired by the Louvre the year I was born, is considered one of Friedrich’s most compelling paintings. Unfortunately, as far as the seascape, any notes I have of the artist or title appear long gone. Every once in a while I do a Google image search, but I haven’t yet made an identification. If you happen to recognize it, please let me know in the comments below. 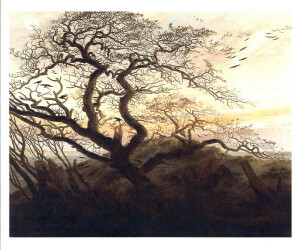 Tree of Crows, a painting by Caspar David Freidrich. Essentially I reduced Tree of Crows to its most basic element, the tree, and superimposed it onto the other painting. I did make a few other modifications, but my main intent was to retain the sky and sea. 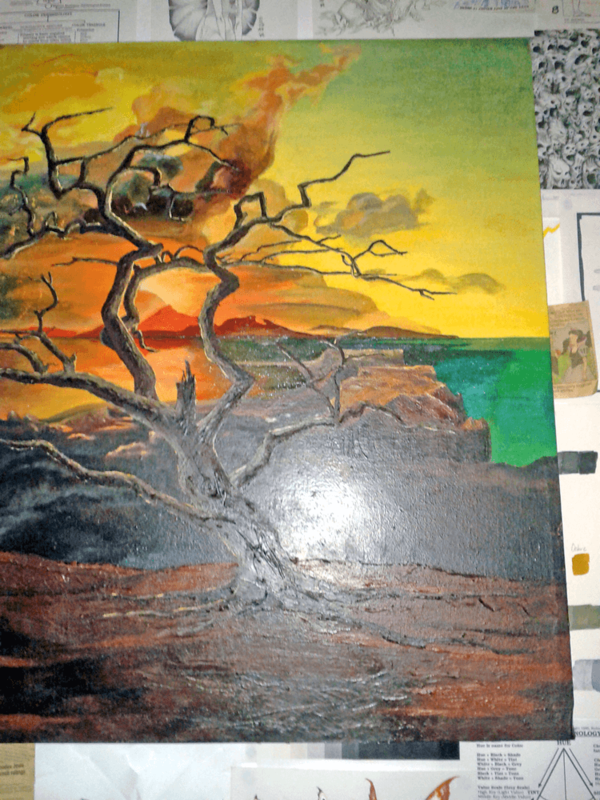 The only known photograph of the early stages of painting Mashup #1. There are no photographs of the early stages Eventually one photograph of the early stages surfaced; cameras weren’t ubiquitous on phones then as they are now. I do have a few progress shots of the later stages of painting. They are of varying and questionable quality, but reflect the stages of progress the painting went through. 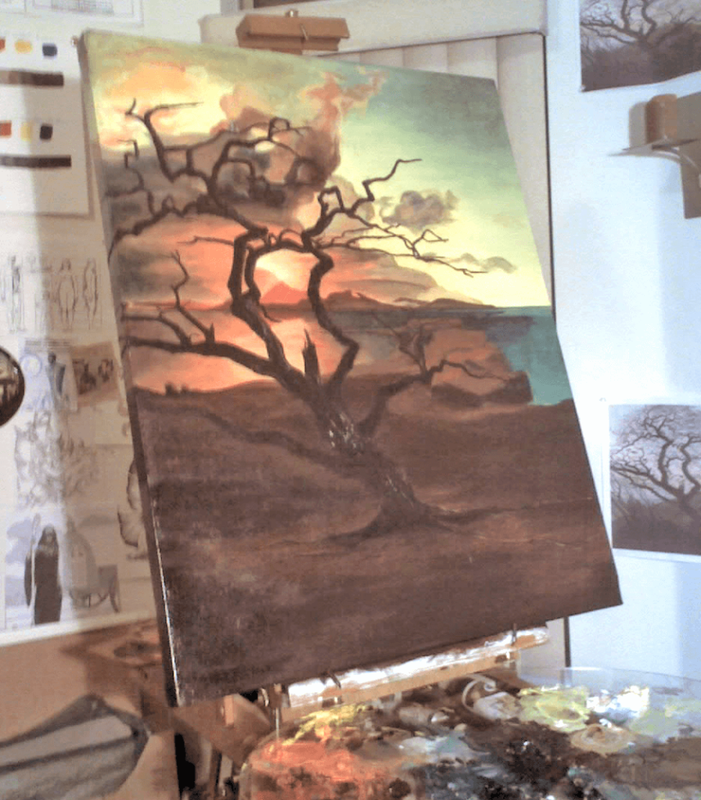 The foreground and tree in the early stages of development. The foreground is relatively undeveloped at this point. There is not a lot of detail on the tree, either. A late stage photo of Mashup #1 in progress. 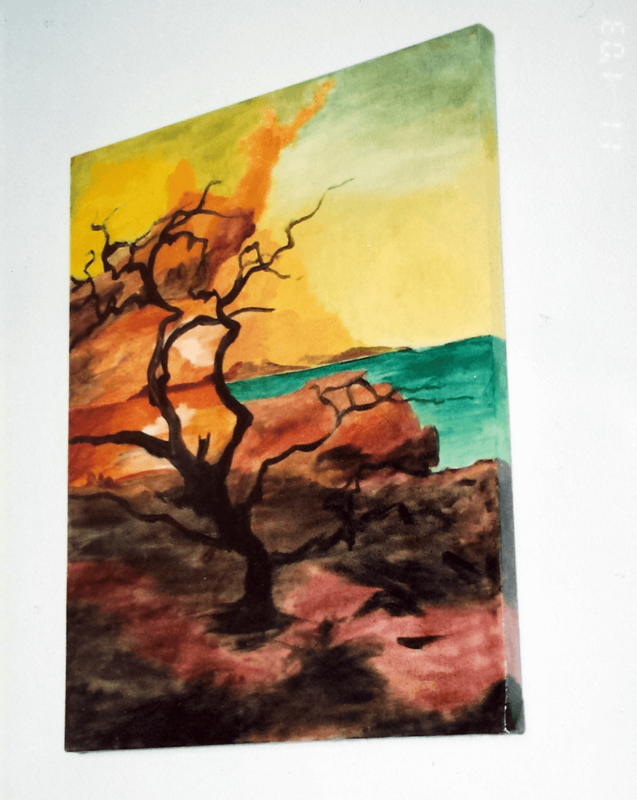 This is an admittedly bad photograph of the foreground and the tree a little further developed. In spite of the glare from an over head light (or perhaps because of it) you can begin to make out the texture in the tree and s bit in the foreground, as well. Mashup #1 oil on canvas after the first coat of varnish. 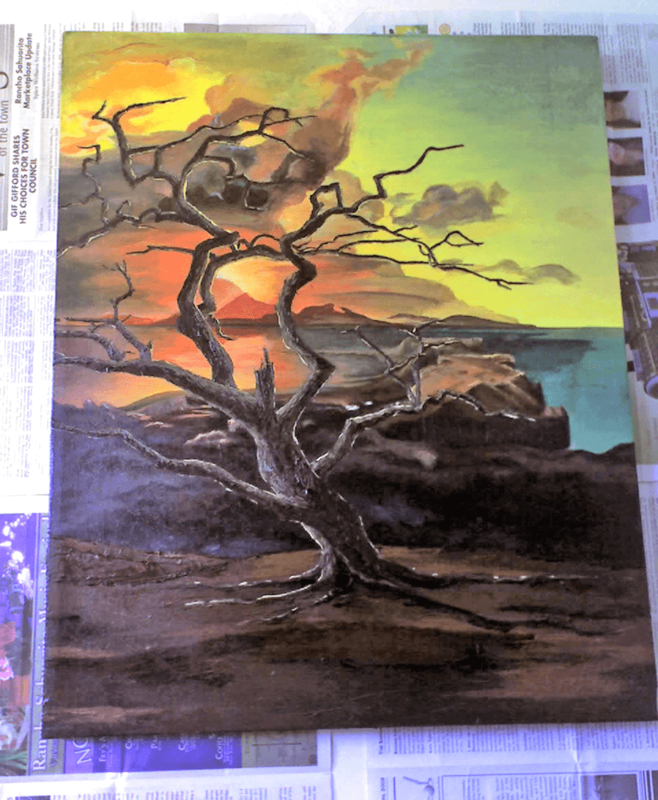 I used 3 different mixes of varnish on this painting. A matte varnish for the foreground with its haze and fog and tree, gloss varnish for the sea as it disappears far off in the horizon, and a mix of the two to create a subtle atmosphere for the sky. The original painting is owned by a private collector and is not available.